I used to flip the end of the wings of paper airplanes upward and breathe on the head of the airplane to make it fly farther. According to John Collins—the maker of the paper airplane with the world record for the longest distance—I was doing it wrong. This video shows how to do it properly. This is the video that shows how they broke the world record. Former Cal Berkeley quarterback Joe Ayoob is the guy throwing the plane. 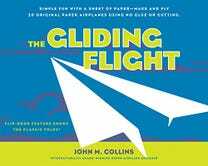 If you want to learn how to make other great paper planes you can buy John's books here and here.